Can this robust 1U rackmount recorder and audio interface — which features 24 onboard mic preamps — be all things to all engineers? British manufacturers JoeCo have carved out a niche in the recording market with their BlackBox Recorders, a range of 1U devices intended primarily for recording and reproduction of multitrack audio in a stage environment. The original BBR1U is a 24-track device designed to ‘sniff’ the insert points of an analogue mixer, capturing a performance as a raw multitrack for later mixing, or playing one back for use as a virtual soundcheck. It boasts a number of nicely thought-out features that optimise it for its intended task, such as the ability to run off battery power, synchronised recording across multiple units for higher track counts, and bypass relays that ensure it passes signal even when power is lost. 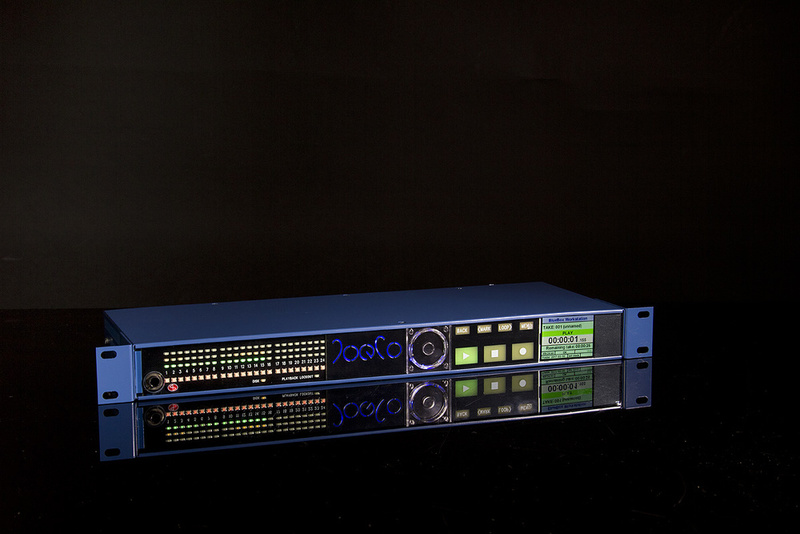 Since its launch in 2009, in fact, the BlackBox Recorder has become something of an industry standard, and JoeCo now offer a number of variants with different I/O configurations. They’ve also accumulated the inevitable collection of user feedback along the lines of “It would be great if the BlackBox did X”. And, in response to that user feedback, they’ve created the BlueBox Workstation Recorder, a device that not only does X, but also Y, Z and a little bit of A too. Whereas the BlackBox Recorder remains a stand-alone recording device, its new sibling is both a recorder and an audio interface for Mac OS and Windows — and, almost uniquely, can fulfil both roles at once. Up to 24 channels of 24-bit audio at sample rates up to 96kHz can be sent over USB 2 to a computer running DAW software, with the DAW returns feeding the BlueBox’s analogue outputs. The same input signals can be recorded simultaneously to an attached USB drive, offering a level of redundancy that would otherwise require two entirely separate recording systems to achieve. The BlueBox is currently available with three different I/O configurations. The model supplied for review is designated the BBWR24MP, and closely follows the layout of the BBR1MP variant of the BlackBox Recorder. It features 24 analogue inputs and outputs, all housed on DB25 connectors; all are balanced, and there are optional mic preamps on all 24 inputs, with digital control over gain, phantom power, pad, polarity reversal, a soft limiter and a high-pass filter. There are also two quarter-inch headphone sockets, one on the front and one on the rear, while the rest of the back panel is populated with a wide array of non-audio-carrying sockets. These include connectors for the 12V DC power supply and optional nine-pin hardware remote control, sockets for word and video clock, a quarter-inch jack which can accept a linear timecode signal on the tip and footswitch controller on the ring, and a PS2 socket for attaching a standard QWERTY keyboard. The second variant is called the BBWR08MP, and offers a slightly less expansive range of I/O. There are still 24 analogue inputs, but only the first eight incorporate JoeCo’s switchable mic preamp — inputs nine through 24 operate at line level — and there are just the eight line outputs. Finally, there’s the BBWR24B, which omits mic preamps altogether, but has two sets of ADAT-format optical digital inputs as well as 24 line-level ins and outs. All three BlueBox Workstation Recorders share the same front panel that is used in the BlackBox Recorders, and which looks and feels markedly different from that of any other audio interface I’ve tested. The left-hand side of this is taken up with 24 three-LED ladder meters and Record Arm LEDs, one for each input. To the right of these and the large illuminated JoeCo logo lies the tactile part of the interface, which consists of a large ‘rotary’ encoder, equally substantial Play, Stop and Record controls, and four smaller ‘buttons’ for navigating menus, dropping markers and so forth. I’ve used inverted commas around the words ‘rotary’ and ‘buttons’ because there are no moving parts here: the controls sense finger pressure but do not actually rotate or move in and out; this feels a bit weird, but presumably removes a potential source of failure. Finally, at the right-hand side of the front panel there lurks a high-resolution colour screen, used mainly to display menus during setup. The review BlueBox was supplied with JoeCo’s optional Breakout Box. Connecting three DB25 cables between this and the BlueBox allows you to bring all of the latter’s analogue inputs out as female XLR sockets on a 2U rack panel, which can also be used to relocate the BBWR’s USB connector. The current Breakout Box unfortunately does not incorporate an extender for the rear-panel headphone socket, but JoeCo told me they may add this in future versions. The rear panel interfaces with the analogue world via D-Sub connectors, which is inevitable given the number of channels, but there’s also an optional breakout box which can present the mic inputs as XLRs. As a stand-alone recorder, the BlueBox inherits most of the functionality of the BlackBox Recorder, so rather than cover those aspects of its operation in detail, I’ll refer interested readers to Hugh Robjohns’ review in SOS January 2010. However, it should be noted that Hugh was writing about the original BBR1U version; the BBR1MP, from which the BlueBox is derived, is a newer product. It should also be pointed out that since the launch of the BBR1U, new features have been added to the range through firmware updates and the development of various accessories. Perhaps the most significant of these developments has been the introduction of several different remote-control options, enabling mastery over one or more BlackBox Recorders from an iPad. This can be connected wirelessly using Wi-Fi or Bluetooth, or physically using a network cable. Doing so requires the recorder to be expanded with one of three small hardware add-ons; none of these was supplied for this review, but it’s pretty clear that the addition of mic preamps in the BBR1MP and the BlueBox recorders makes the remote control a practical necessity in situations where a computer is not available. Individually adjusting gain, phantom power and so on for 24 mic preamps from the front-panel menu using a single rotary controller is just too slow for the real world, especially if you are trying to respond to changing levels coming from stage. The BBWR cannot perform punch-ins and has no internal editing features: it is designed purely as a capture and playback device, not as an all-purpose studio recorder. It is possible to arm and disarm individual tracks, ensuring you don’t waste disk space recording unused inputs, though again, you wouldn’t want to attempt this very often without the remote control. In a studio context, JoeCo say they envisage the BBWR being placed in Record at the start of each day’s work and left running throughout the session. As it records time-stamped WAV files, recovering ‘lost’ DAW recordings from a BBWR safety copy should be fairly straightforward. The biggest difference between the BlueBox and BlackBox is, of course, the former’s ability to act as a USB audio interface for a Mac or Windows computer, in which capacity it offers some interesting and unusual features. The BlueBox is class-compliant, so will work on Mac OS without the need for any driver installation. However, you’ll certainly want to install the free JoeCoControl utility, which, like the iPad app, enables the BlueBox to be set up and controlled from your Mac. The same utility is also available for Windows, and PC users will need to install drivers too. I had no problems selecting the BBR as an audio device both within Mac OS and in all the DAWs I tried. The JoeCoControl software employs an unusual visual paradigm that presents three small windows all in a row. Within these windows, the buttons and faders are minute but operable; however, you can also click a red triangle to float a larger version of each window. The idea, say JoeCo, is that the basic JoeCoControl interface can be fitted on the same screen as a DAW window, allowing users to keep both in view at the same time. 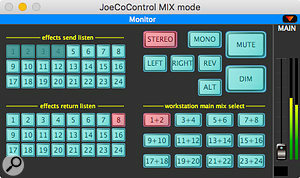 JoeCoControl can operate in three different modes, called Live, Studio and Mix. Whichever of these you are in, the leftmost of the three miniature windows is used to set up the preamps. Its faders are actually gain controls, while the column of buttons above each fader switches related parameters: mic/line input, a 28dB pad, 48V phantom power, a high-pass filter, limiter and polarity reversal. This is all easy enough to use, though as it looks very similar to the adjacent mixer window that appears in Live and Studio modes, I wonder whether it might be re-coloured in order to avoid accidentally confusing the two. The function of the other two windows depends on which of the three JoeCoControl modes you select. The simplest mode, and the only one that was available at launch, is called Live mode. This is designed to provide a basic way for an engineer equipped with headphones to keep tabs on what’s going to disk during a straightforward live recording, where there is no need for cue mixes or loudspeaker monitoring. In Live mode, the central panel displays 24 mixer channels, each corresponding to a BBWR input, while the right-hand panel displays another 24-channel mixer devoted to the DAW returns, which in turn feed the respective physical outputs on the BBWR. Both of these mixes feed both headphone outputs, making it possible to easily audition signals going into and out of the DAW, which is pretty much what you need in such circumstances. Only the front-panel headphone output receives the PFL bus, so an engineer can solo inputs in the mix without affecting what a performer is hearing from the rear-panel phones socket. There are situations where Live mode might actually be the most appropriate for studio recording. For instance, if you were setting up cue mixing and monitor control either within your DAW or using a hardware mixer, the simple in-to-out routing would be exactly what you’d need, with the ability to check individual channels using the PFL bus a nice bonus. However, there are good reasons why most audio interfaces do offer built-in low-latency cue-mixing and routing functionality, and JoeCo’s take on this is represented by the second JoeCoControl configuration, called Studio mode. In this configuration, the central mixer retains its basic overview of the 24 inputs, but acquires four tabbed pages and a bank of four stereo ‘stem’ channels. Each mixer page allows you to create a separate balance of the 24 input signals, auditioned at near-zero latency, while the first eight output channels your DAW sees feed the stereo stems rather than physical outputs 1-8. Mixer pages 2 and 3 are hard-wired to outputs 5-6 and 7-8, while mix 4 emerges from the rear headphone socket and, if present, from outputs 9-10 (available in the 24MP and 24B, but not the 08MP). Mix 1, meanwhile, is routed to the main headphone socket and to main (outputs 1-2) or alternate (3-4) monitor outputs. The JoeCoControl software operates in various modes, with a number of different screens. 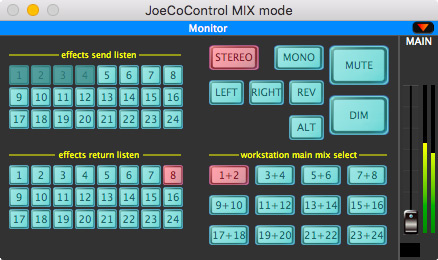 In this mode, the rightmost panel of JoeCoControl ceases to be a mixer and becomes a well-specified monitor controller page, with the aforementioned speaker switching joined by mono, left and right mute, dim and talkback controls. Many rival audio interfaces in this price bracket have rather minimal monitor control features, so it’s great that JoeCo have put so many in — but all the more a pity that there’s no way to access them without using a mouse. Alas, JoeCoControl can’t be operated from a MIDI controller, and none of the existing remote-control options can access these monitoring features, so if you want a real button to press to engage talkback or switch speakers, you’ll still have to buy a monitor controller. JoeCo say that they hope to make it possible to control this page remotely once they have gathered enough user feedback about how this can best be implemented. The Studio Mode provides useful monitoring facilities.JoeCo have clearly put some thought into designing the Studio mode. It behaves rather differently from any other audio interface control panel I know of, but reveals itself to be quite logical once you get to know it, presenting a balance of simplicity against feature density that is well judged for most studio uses. I’d imagine that four low-latency cue mixes is plenty for most people, for example, and having them hard-wired to specific outputs is unlikely to prove too restrictive. True, there are no built-in DSP effects to give performers ‘comfort reverb’ and so on, but you could always use one of the ‘stems’ to mix in effects generated in your DAW if needs be. About the only thing that’s completely off the map is surround monitoring. The final JoeCoControl operation mode is perhaps the most unusual. It’s called Mix mode, and is designed specifically to allow outboard hardware to be integrated into a DAW session. 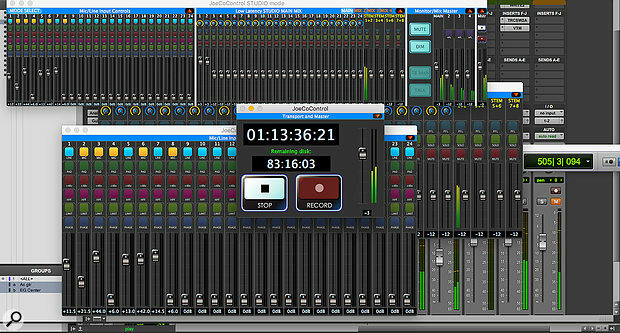 In Mix mode, the central window displays most of the same monitor control features as are available in Studio mode, with the exception of talkback. It also displays three grids of buttons. One of these selects which output pair from the DAW is to be treated as the main monitor mix; this, as before, is routed to hardware outputs 1-2 or 3-4 depending on whether the Alt speaker button is selected. The remaining outputs, and all the inputs, are laid out in separate button grids, and selecting one of these buttons auditions the relevant output or input on the BBR’s PFL bus. This can be auditioned from the front-panel headphone output, which is designated as the engineer’s. The Mix mode screen offers a novel, and rather clever, way of auditioning outboard gear plumbed into a DAW.Testing this mode to the full would have required more studio rewiring than my colleagues would tolerate, but having used it to bring a couple of outboard units into a Pro Tools mix, I think it’s a very clever idea. Setting up external hardware as DAW inserts is rarely straightforward, and the ability to audition inputs and outputs at the press of a button makes the inevitable trouble-shooting process a lot simpler. Over the last few years, I’ve tested numerous multi-channel audio interfaces. To an extent, all of them have employed similar design conventions, and they often stand or fall on how well they implement the same ideas. The BlueBox Recorder throws this orthodoxy into sharp relief, because it does things differently. This is apparent from the moment you unpack the box: its unglamorous but rugged case and workmanlike front-panel design give it a BBC test equipment air that is the antithesis of sleek units from the likes of Apogee, Focusrite or UA. 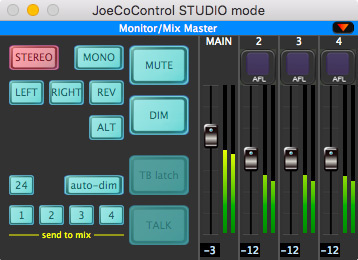 And, as described above, the JoeCoControl software also cheerfully departs from the beaten track; it could never be called stylish, but does what it needs to do, and implements some thoughtful original features such as Mix mode that I’ve not encountered elsewhere. That’s not to say that all of JoeCo’s design decisions are wholly positive, mind you. Throughout the review period, I never got used to the feel of the non-moving front-panel controls, and using them for anything other than recorder transport functions is painfully slow. JoeCo told me that the front-panel controls are really there only as a legacy option in case your computer or remote control goes down, which is fair enough, but other rackmounting interfaces in this price bracket have genuinely useful front-panel controls that offer real benefits in terms of usability. Nor can I think of any advantage to putting a headphone socket on the rear panel of a rack unit; and although I can understand why JoeCo have chosen to use D-Subs for the sake of compactness, it’s a shame that there is absolutely no full-sized I/O apart from the headphone sockets (and the optional breakout box). A pair of quarter-inch jacks to connect monitor speakers and perhaps a couple of inputs for control-room overdubs would be useful in many situations. Finally, it should be mentioned that JoeCo are not engaging in the ‘specs war’ that has seen other manufacturers claim ever-more-impressive performance figures for their interfaces. In terms of latency (see box), the BBWR is unexceptional as far as USB interfaces are concerned, and is bested by most Thunderbolt devices. More eyebrow-raising are its audio specifications. When relatively affordable products such as MOTU’s 1248 can claim a dynamic range of 118dB on the inputs and 123dB on the outputs, the BlueBox’s quoted 102dB and 98dB respectively are surprisingly low in something costing this much. I raised this with JoeCo, who told me that they had chosen the converters that, to them, sounded best, regardless of on-paper performance. It’s certainly true that numbers are no guide to subjective sound quality, and there are many engineers who still prefer the ‘classic’ converters in systems like the iZ RADAR to more modern alternatives; nevertheless, it’s not hard to imagine circumstances where more headroom would be desirable. In use, I had no complaints about the BBWR’s subjective sound quality, though for some location recording sessions, the perceptible fan noise could prove an issue. The mic preamps are very well specified, with an equivalent input noise (EIN) better than -124dB (60dB gain, 150Ω termination). With a basic gain range running from +6 to +60 dB augmented by a switchable 28dB pad, they are versatile enough to cope with any level you’re likely to encounter, and sound good enough that I’d be perfectly happy to use them on pretty much anything. I can’t think of any other computer audio interfaces that pack 24 mic preamps into a 1U rack, so this alone must be counted as a major selling point for the BBWR24MP, especially if you ever need to record concert performances from mic-level splits. In a studio environment, meanwhile, the model that might prove most tempting is the line level-only BBWR24B (which, I’m told, has no internal fan and thus produces no fan noise). Wired into a hardware desk and a patchbay, it would offer a cost-effective way of tracking up to 24 inputs at once, with the security of redundant recording to hard drive; then, simply by flipping into Mix mode, all the studio’s outboard could easily be integrated into a DAW mix. It’s not often that one can say this of a product under review, but the BlueBox Recorder really has no direct competitors. There are lots of multi-channel audio interfaces around, some of which offer a lot of inputs and mic preamps, and most of which have comfortably better dynamic range specs. However, almost none of them offer redundant recording, or the ability to be run from batteries, not to mention professional features such as synchronisation to video reference and SMPTE linear timecode. The most obvious comparison is with RME’s Fireface UFX+, which features their DURec direct-to-disk recording, but even here, the differences stand out more than the similarities. The Fireface is a Swiss Army knife of the interfacing world, providing a wide range of different I/O types and immensely flexible routing and mixing functionality; the BBWR is much more tightly focused on the specific job of capturing large numbers of analogue inputs in the most straightforward and reliable way possible. Its recording functions are also significantly different: the BBWR records individual mono, time-stamped WAV files, which can be named, whereas the UFX+ records a single massively multi-channel WAV file that must be split before it can be worked on in a DAW. If, like me, you’re accustomed to the conventions of high-end audio interface design as implemented by manufacturers such as Apogee, Focusrite, UA or RME, the BlueBox Workstation Recorder might seem a bit of a culture shock. Both its physical design and its software control panel look unsophisticated in comparison with the Symphony I/Os and Apollos of this world; and operationally, it ploughs its own furrow. However, the more I used the BBWR, the more I came to appreciate that JoeCo have gone their own way for good reasons, and that what it lacks in style, it makes up for in substance. Considered as a studio interface, it is still a work in progress in some respects, and will be more tempting when and if things like hardware control over the monitoring features can be implemented. But considered as a recorder optimised for capturing concert performances, it has few peers — and as a product that bridges both categories, it is unique. On Mac OS, the BlueBox Recorder uses Apple’s class-compliant driver. This achieves respectable performance, though it is not as good as the custom drivers written by manufacturers such as MOTU, RME and Zoom. The lowest buffer size on offer is 32 samples, and at a 44.1kHz sample rate, Logic reported a round-trip latency of 4.7ms at this setting. When I did a loopback test, however, I found that the true latency was some 100 samples higher than this, suggesting that the BBWR’s internal DSP imposes a delay of its own. The lowest achievable latency at base sample rates is thus nearly 7ms: acceptable for many purposes, but not in the same league as most Thunderbolt interfaces, or indeed of devices such as the RME Fireface UFX+. A 32-sample buffer size is also quite demanding on CPU load; at higher buffer sizes I measured true round-trip latency figures of 8.4ms (64 samples), 11.3ms (128 samples) and 17.7ms (256 samples). Just before this article went to press, I also managed to get my hands on the Windows ASIO driver. This is a third-party effort familiar from a number of other USB interfaces, including models from PreSonus and Antelope Audio, and as well as allowing you to select a buffer size in samples, it also features a pop-up menu with a selection of named safety buffer modes ranging from Minimum Latency upwards. Changing the actual buffer size invariably results in a warning appearing that the new buffer size is not compatible with the existing safety buffer setting, which gets old fast. At the lowest possible combination of a 64-sample buffer size and Minimum Latency safety buffer, Oblique Audio’s RTL Utility reported a round-trip latency of almost exactly 8ms at a 44.1kHz sample rate. The next recommended setting up from this — a 128ms buffer size and Low Latency setting — yielded 12.8ms. Unsurprisingly, my aged Windows machine wouldn’t reliably run music software at these settings, though. All in all, then, the BlueBox Recorder is usable with soft synths and for real-time input monitoring, especially on Mac OS, but it does not stand out for its low-latency performance. With redundant recording to hard disk and battery power options, it’s probably the most robust computer-based recording system there is. Varied options for remote control and synchronisation. 24MP variant crams 24 versatile, digitally controlled mic preamps into a 1U rack unit. 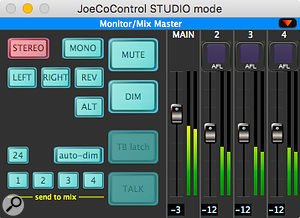 JoeCoControl’s Studio and Mix modes offer decent cue-mixing functionality with some unusual and welcome additions. Adjusting parameters from the front panel is tedious. Monitor-control features can only be accessed from the JoeCoControl utility at present. Dynamic range specifications don’t compare well to the competition. Second headphone socket is on the rear panel. Not a replacement for a traditional studio multitrack, as it can’t punch in. Having carved out a niche with the BlackBox Recorder, JoeCo have enlarged it considerably with the new BlueBox Workstation Recorder. As a tool for live concert recording it has few rivals, and it is evolving into an interesting alternative to conventional studio interfaces. BBRW24MP £3594; BBWR08MP £2994; BBWR24B £2274; Breakout box £354. Prices include VAT. BBRW24MP $4795; BBWR08MP $3795; BBWR24B $2795; Breakout box $495. Full Scale AV +1 615 833 1824.